of course, the blast of all blasts of the teams i was in was the vts team in nsp cebu. we were the craziest bunch thanks to crazy gly, crazy noel, crazy nanie, silent but crazy pong, silent but crazy korn, and most of all, alluring but crazy me! hehehe. the picture was taken during our christmas party last year which was crazily made. imagine, there were only 6 of us yet we made a program for our party complete with invitation cards, opening remarks, welcome address, games, raffle draw (consisting of pepsi, cornflakes, bottled iced tea, pringles, etc), claim stub for the food, closing remarks, sing and dance presentation and contest, and my farewell walk and speech due to my resignation. 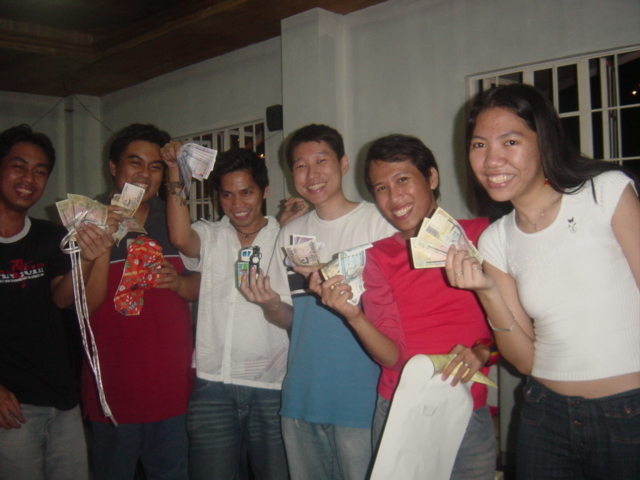 and our exchanging gifts was worth 1,500 pesos each!!! just take a look at the picture at what each of us received! hahaha. to the one you love or to the one who loves you?